Whenever a table is to be modified the document's text cursor must first be moved to a position within the table (i.e., click the mouse anywhere inside the table). The Insert Table menu item becomes Edit Table when the text cursor is inside a table. New tables are created using Insert Table. Rows and columns can be easily added and removed using Edit Table. The width of a column can be changed by grabbing the right edge of the column with the mouse and dragging the edge until the desired column width is obtained. When the mouse is moved over a column's right edge the mouse cursor changes to to indicate the mouse is in position to grab the edge by pressing the left mouse button. Note: The column width can not be changed unless the document's text cursor is within the table. 1. 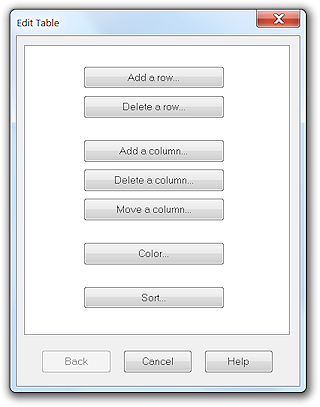 Select the row to be moved by clicking to the left of the row. 2. Cut (Ctrl+X) the row to the Windows clipboard. 3. Add a new empty row at the desired table position. 4. Select the new row by clicking to the left of the row. 5. Paste the target row (Ctrl+V) from the clipboard. 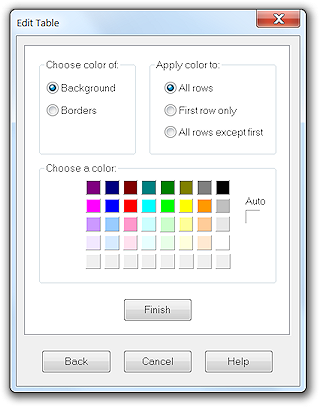 Both the table background color and table border color can be changed as desired. The first row can have different background and border color from the rest of the table to better distinguish it as a table header row. A table's border can effectively be made invisible by changing its color to white. A table's rows can be sorted based on the text of any chosen column in the table. Table rows can be sorted in ascending or descending order. 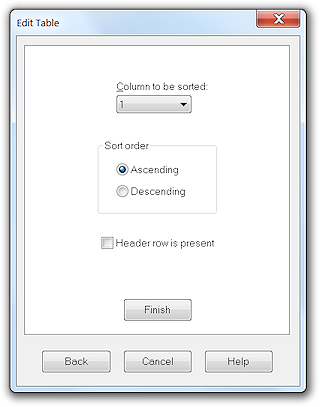 If the Header row is present check box is checked then the first row of the table is excluded from sorting so that it remains as the top row in the table.